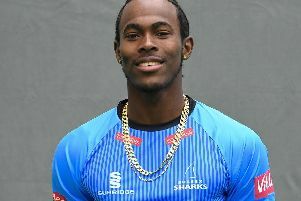 Sussex Sharks will be looking for back-to-back Royal London One-Day Cup wins when they welcome Middlesex to the 1st Central County Ground on Friday. Ben Brown’s men return to Hove having inflicted a 75-run defeat on Somerset at Taunton on Tuesday, with Luke Wright blasting 105 runs in just 87 balls during the Sussex innings. The side have won two of their three matches in the competition so far and are one of four sides level on four points in the South Group. Hampshire, with a one-hundred per cent record, sit on top of the division with six points. For the match against Middlesex, Sussex head coach, Jason Gillespie has named the same 14-man squad that travelled to the west country earlier in the week. Stiaan van Zyl remains unavailable with a knee injury. The South African has now seen a specialist and is likely to require an extended period of rest and rehabilitation. Reflecting on his side’s win on Tuesday and looking ahead to the Middlesex clash, Gillespie said: “I was delighted with the way the boys put into practice the lessons they had learned from the defeat to Hampshire against Somerset on Tuesday. “We were defending a big score after a special knock from Wrighty [Luke Wright], but we knew Taunton was a place where sides can chase big totals. “The lads realised they couldn’t take their foot off the gas in the field and they implemented our plans really well. “I thought Ben Brown’s captaincy, particularly during the middle overs, was exceptional. Somerset would have been feeling confident at the 30 over mark and Browny deployed the experience of Briggs and Wiese very intelligently. “When Danny picked up those two wickets in the 40th over, that changed the game in our favour. We stuck to the plans we’d discussed, didn’t panic and the fielders backed up the bowlers up brilliantly. “The boys are relishing another big test against Middlesex tomorrow. They’ve got a very strong side with a number of international cricketers and will be confident after a good win against Glamorgan yesterday. Tickets are available online until midnight on Thursday, and then on the gate from 9.30am on Friday. Those unable to attend the ground can watch the match live with commentary from BBC Sussex via the stream on the Sussex Cricket Match Centre.